I know this sounds crazy to butter your toast first, but stay with me. I know it goes against everything you ever done and known about making toast. Most of us could probably make a piece of toast blindfolded and sleepwalking because it’s something you’ve been doing your whole dang life! But stay with me. I read an article talking about this and I put it to the test. I tried six different methods on one cookie sheet so I will get to those results in a moment. 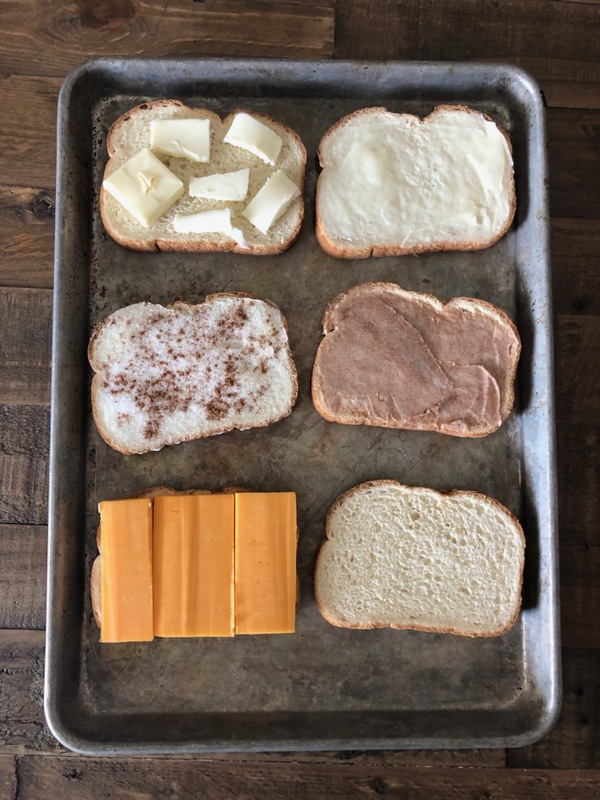 The idea is, when you slather toast with a generous helping of butter and toast it in a toaster oven, the butter doesn’t just skim the top, it works its way down into the middle and even sometimes the bottom of the toast. The top then stays toasty, and the middle stays soft and dense, and full of all that buttery flavor, just how you’d like it. This works beautifully for compound butters, specifically a cinnamon sugar butter. The generous amount of butter will work it’s way down through the toast, but the cinnamon and sugar will stay on top and become crusty, similar to crème brulee. Another method for regular buttered toast I read about that people absolutely swear by is cutting off chunks of butter and placing them throughout the bread, leaving about 30% of the bread exposed. This is supposed to create delicious little pools of butter and toast it a little better. I’ll tell you if they were spot on with this method soon! Bottom right: cheese toast because, well, you might as well make a piece! Bottom left: plain piece of bread. The winner of the butter toast challenge was indeed the “butter pool” toast. It really made all the difference in the world to cut chunks of the cold butter and have them make pools in the piece of toast. It really made the toast taste the best it possibly could. It really had the best, rich, deep flavor profile of butter of all of them. As for the plain piece of toast, as you can see that it did get the toastiest, and as I put butter on it afterwards (AKA--the typical way people make toast), it still tasted nice, but didn’t have the depth of flavor the other two did. The kind where you layer the butter, sugar and cinnamon ended up being the winner for me because it had more of a crème brulee effect where the top was nice and crunchy you get to bite into that caramelized sugar every bite. That is my favorite part of the cinnamon sugar toast so that was the winner for me. 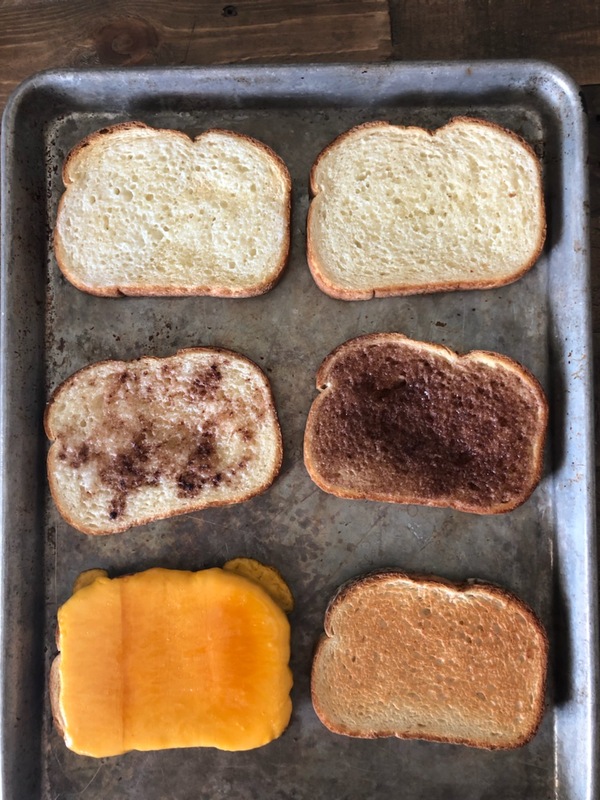 Well, maybe you should get out there and experiment a bit yourself and see if you find a new, favorite way of making toast, you really might be surprised!